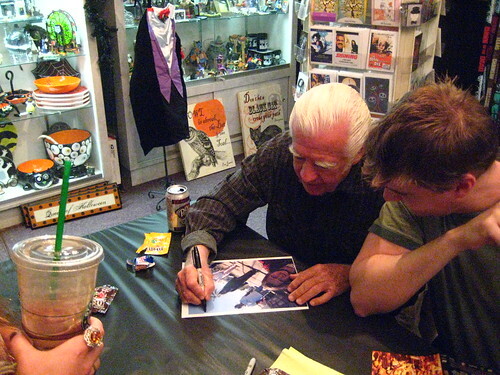 Saturday the Boy and I took a trip back over to Dark Delicacies to say hi to Clu and the Feast 2 gang and get our copy of the DVD signed as well as my Cut! 2008 photo with zombies. He asked for a copy, too, but I only had one. D'oh! Next time, Clu! And this time I'll sign it! Many horror movies come and go but few and far between are the truly unique ones that last forever, especially sequels. Dimension's Feast II: Sloppy Seconds serves up a film worth remembering. Horror fans I urge you to feast your eyes upon this sequel from the writers of the Saw sequels and be sure to watch on an empty stomach!